NOTE: After paying for this item, you MUST follow the target submission instructions. The Custom Profile Targets and Instructions can be found under the "PDF Downloads" tab (above this note, on this page). The Rough Paper Target should be used for papers with a very rough surface and for all canvas. 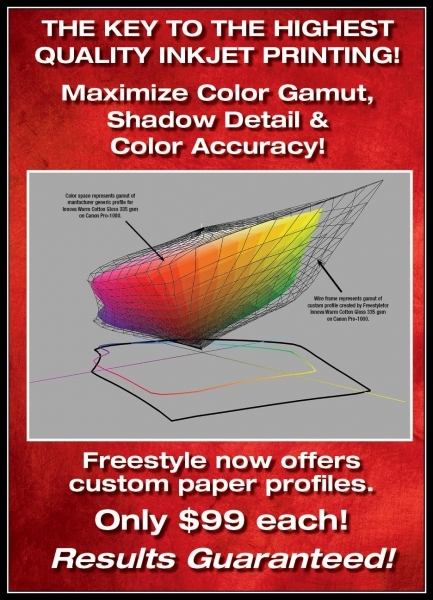 Do you want to maximize the color gamut for every image you print? Do you want to open up the shadows and show detail in your image that otherwise could be hidden? If you answered "yes" to these questions, then a Freestyle Custom Printer Profile would be right for you. Custom profiles allow you to realize the full potential of your images on paper - in color accuracy, overall color gamut, maximum black and shadow detail. If you want to print your images knowing that you are printing the very best image possible, we can help! Freestyle can create a custom profile for YOUR printer, for any paper, for ONLY $99! A template is provided for you to print out a test pattern which you will mail back to us (see "PDF Dowloads" tab). We then scan in those colors and, with our commercial-grade profile creating hardware/software, create a one-of-a-kind CUSTOM PROFILE for your system, that will greatly enhance your prints - guaranteed! If there is one thing that will contribute to your printing success, this is IT! You will save time and money too! No need to print tests or multiples to pick the best one as they will all be profiled for repeatable results. *Please note, ​​because Awagami ​Japanese ​papers ​are made from organic fibers and a specialized coating that preserves the texture of true 'washi'​, ​slight variability may occur within printed editions using any ICC profile.